1. Select Your Service Type. $5.95/ft2 for Paper, $9.95/ft2 for Fabric. Ships same day if received by 1:00 pm EST Monday-Friday. Files received after 1:00 PM EST and before 5:00 PM EST for same day shipping will be charged a 50% premium on print only. Must call to confirm availability. * Changing service type above will automatically update prices. Satin Paper is our standard and recommended for best viewing. Be sure that your poster's final printed size is proportional to your "page setup" dimensions in PowerPoint. Please use Proportional Scale below to confirm that your file will enlarge correctly to your requested size. Not sure your page setup is correct? Use this handy tool to check. All enlargements must be in proportion to your file's "page setup" size. Use this tool to confirm that your file will enlarge to the size you wish to make your poster. Click "Calculate"! Calculator displays the other dimension proportionally. Click here to see zone map. Charge to our FedEx Acct. No. 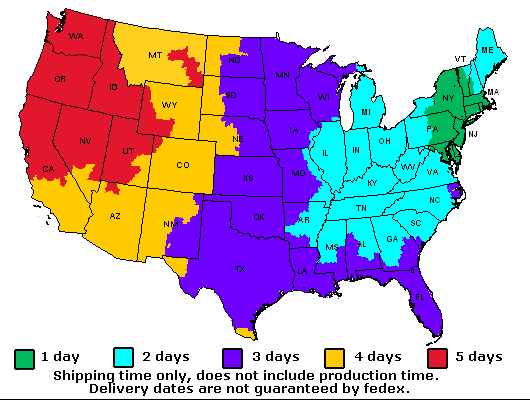 *Shipments to Residential addresses will incur a FedEx imposed $4.00 surcharge.